Titration is a laboratory method of quantitative analysis used to determine unknown concentration of known substance. Analysis is performed using burette - kind of laboratory glass made for exact measurement of volume of solution used. The most popular titrimetric experiment is a determination of amount of acid. Imagine you have a solution of a sulfuric acid of unknown concentration. Pour exactly measured volume of sulfuric acid (VH2SO4) into a beaker and add few drops of alcoholic phenolphtalein solution. Solution will be colorless, as phenolphtalein becomes pink only in basic solutions (color becomes visible at pH above 8.2). Now use burette to slowly add NaOH solution (called titrant) of known molar concentration CNaOH. pH slowly goes up. Once all sulfuric acid becomes neutralized one excess drop of strong base is enough to rapidly change pH of the solution and change its color to pink. 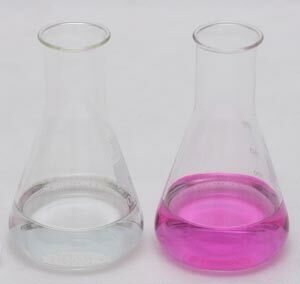 Color change of phenolphthalein during titration - on the left, colorless solution before end point, on the right - pink solution after end point. When the color of the solution changes you know that you have neutralized all acid present - you have reached a titration end point. Using burette scale you may read volume of the titrant used (VNaOH). So we have just determined concentration of unknown concentration of sulfuric acid. Such stoichiometric calculation is the basis of all volumetric analytical methods. They differ when it comes to reagents used and methods of determination of the end point, but the general idea is always the same. A volumetric determination can be no better than the equipment and technique used in performing it. Page was last modified on May 22 2009, 13:51:09.